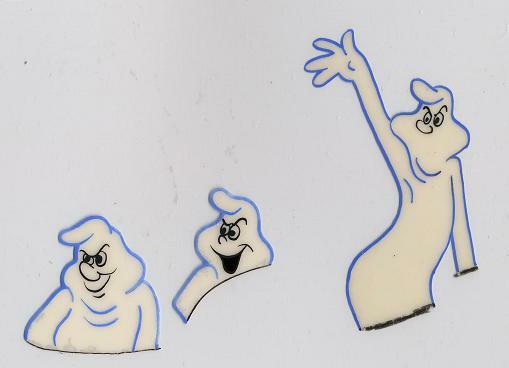 Released by: Paramount (Famous Studios) First Appeared: 1945 Creators: Seymour Reit and Joe Oriolo Casper first appeared in a cartoon entitled ( appropriately enough ) The Friendly Ghost, based on an unpublished story written by Seymour V. Reit ( who, among many other things, worked for Archie Comics and may have co-created Peter Porkchops ) and illustrated by animator Joe Oriolo (a proteg of Felix the Cat creator Otto Messmer, and mostly famous for TV cartoons about Felix). It's unclear whether the idea for the story came from Reit or Oriolo. 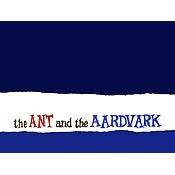 The cartoon was directed by Isadore Sparber and released by Paramount's Famous Studios, as part of its 'Noveltoons' series, in 1945. This sentimental tale of a ghost who didn't want to scare anyone was well enough received to spark a sequel, There's Good Boos Tonight (1948), also directed by Sparber. 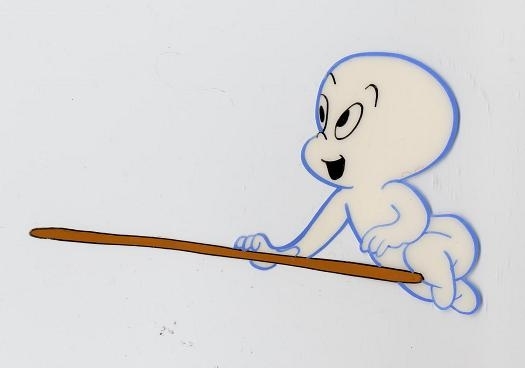 Casper appeared in several more films before Paramount sold the rights to Casper to Harvey Publications in 1958. 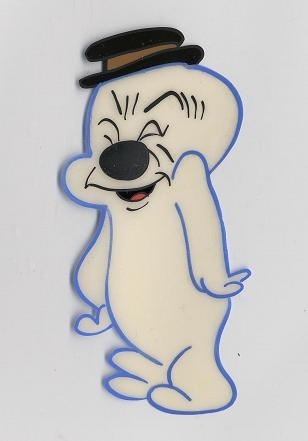 Harvey decided to feature Casper in a comic book starting in 1958. Casper the Friendly Ghost was first theatrically released in 1945 by Paramount's Famous Studios division. The concept for the character was that he was a ghost that didn't want to scare anyone, yet still did so, unintentionally, when just trying to be friendly. 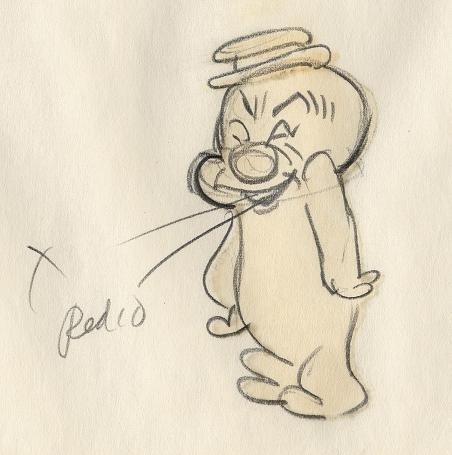 His appearances were sporadic until the early 1950's, when a regular series of shorts were developed around his character. 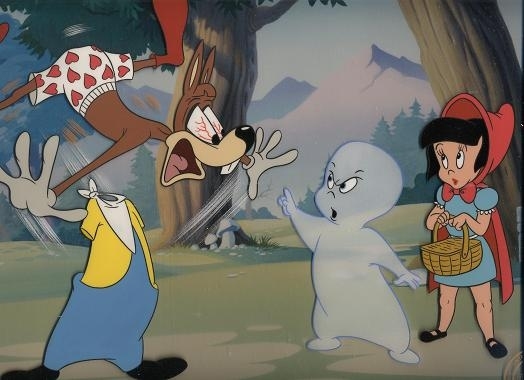 When the 1960's started, Casper got his first shot at a TV show, featuring many new cartoons mixed with the old, and the exposure proved to be a good one, causing all comic books related to the little guy to suddenly become big sellers. There has been the usual flood of related merchandise over the years, as well. #HT3 - Paramount Famous Studios - 'Casper the Friendly Ghost', 1960's. The drawing image measures 2.50' X 4.50' rendered in graphite pencil bearing number #B11. 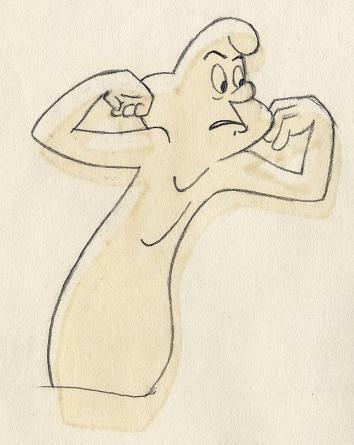 Casper first appeared in a cartoon entitled (appropriately enough) The Friendly Ghost, based on an unpublished story written by Seymour V. Reit and illustrated by animator Joe Oriolo. #HT7 - Famous Studios - 'Which Is Witch ', 1958. The drawing image size measures 2.25' X 4.50', rendered in graphite pencil, bearing the number B-5. 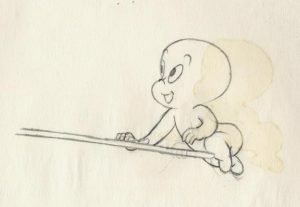 Wendy first appeared in the back pages of Casper's comic, debuting in the 20th issue (May,1954). 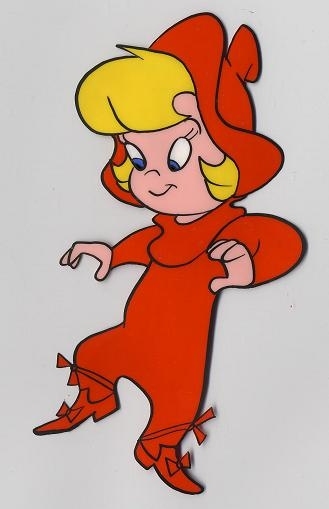 She not only held down a back-up series of her own, but also functioned as a playmate for Casper, who lacked relationships in the mortal realm. #HT15 - Famous Studios - 'Ghostly Trio', 1958. #HT15 - Famous Studios - 'Ghostly Trio', 1958. This Trio cel set up on a trimmed sheet measuring 9.00" X 10.50". The painted Trio cel image measures 1.50" X 2.25". #HT18 - Ghostly Trio, 'Fatso' (1958). #HT18 - Famous Studios - 'Ghostly Trio', 1958. This casper cel set up is rendered on a trimmed sheet measuring 9.00" X 10.50". 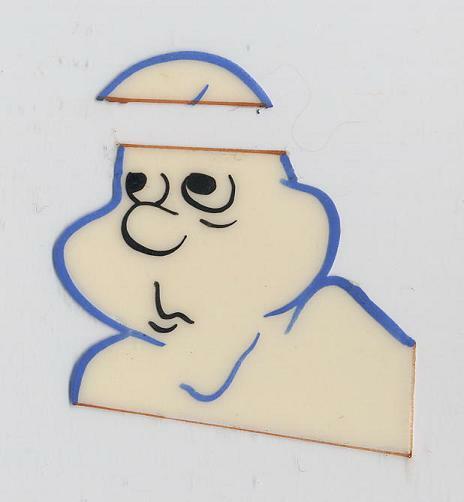 The painted Fatso cel image measures 1.75" X 1.75". #HT12 - Casper the Ghost, 'Once Upon a Rhyme' (1992). 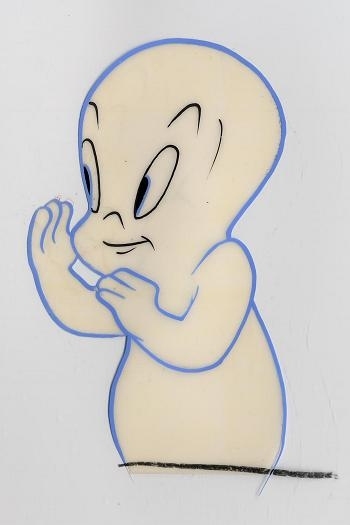 Price: $1500 #HT19 - Famous Studios - 'Casper the Friendly Ghost', 1954. 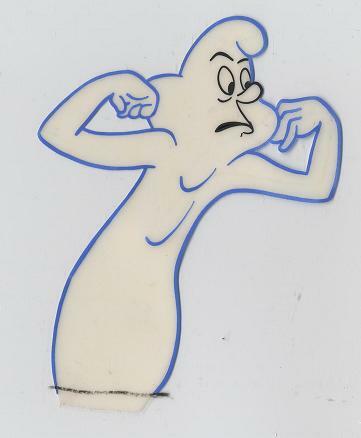 The Casper cel from 'Puss 'n' Boos' is rendered on an untrimmed sheet measuring 10.50" X 12.50". The painted image area measures 5.00" X 6.00". The Cel is framed and triple matted measuring 17.00" X 19.00". 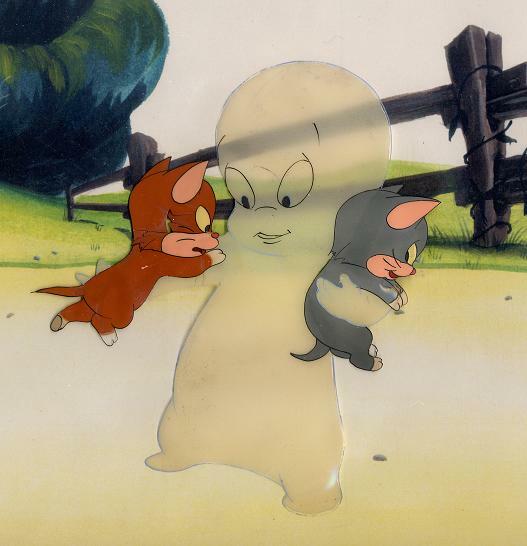 Casper the Friendly Ghost rescues two baby kittens from drowning, and they become his friends forever. They're hungry, though, and they need milk.Casper pulls off his sheet to become invisible so that he can milk a friendly cow. When the cow sees a bucket with her milk in it floating away, she immediately runs to a "Psycowatrist," as she believes that she is losing it. Now, full of milk, one of the kittens sees a nest of baby birds in a tree and charges them. The mother bird comes to their defense. The other kitten ties a string to a bone and drags it in front of a sleeping bulldog. The dog doesn't think it's funny and gives chase. #HT10 - Famous Studios - 'Stretch', 1950's. 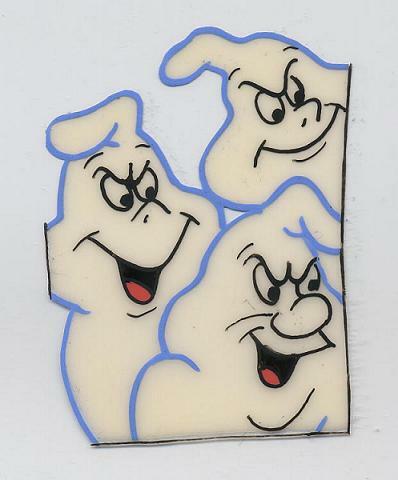 The original production Ghostly Trio cel image measures 3.00' X 3.75', bearing the number M-9. #HT9 - Famous Studios - 'Which Is Witch ', 1958.